Heat oven to 400°F. Sprinkle cornmeal on 12-inch square pizza stone. Unroll dough on pizza stone. Starting at center, press out dough with hands to 12-inch square, forming 1/2-inch rim. Bake 8 minutes. Spread spinach dip over partially baked crust. 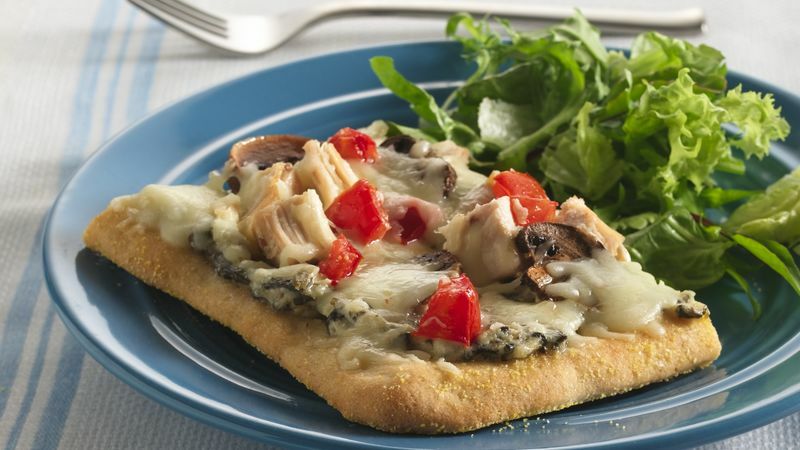 Top with chicken, tomato and mushrooms. Sprinkle with cheese. Bake 12 to 15 minutes longer or until crust is golden brown and cheese is melted. Make a vegetarian version when you omit the chicken. No worries--it's terrific that way, too!